Recommendations for use by concreters, concrete product manufacturers, plasterers, bricklayers, tuckpointers and pre-mixed concrete manufacturers. 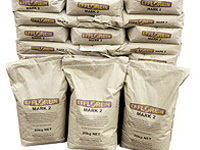 Efflorein® Mark 2 is a unique, multi-functional, cost-effective powder admixture for addition to freshly prepared unset cement-bound mixes to improve their properties - both in their pre-set state and their hardened state. This includes benefits for all concrete (sand, coarse aggregate, water and cement) products, pre-mixed concrete, cement bound roofing tiles/wall masonry/pavers, rendering and masonry mortars (sand, cement and water) cement grouts etc. Economical Efflorein® Mark 2 may be added to mortar which may be mixed and used as it was originally - in times past - with a minimum amount of water - to provide for example a fully functional, durable, watertight, well bonded, trowel applied rendered wall mortar - without the need for acrylic latex resin modification. 1 1/2 % (± 1/2 %) by weight of cement or total cementitious binding material used. This is 1.5kg of Efflorein® Mark 2 per 100kg cement or 600 grams per standard nominal 40kg bag of cement (about 4 ‘coke’ cans full by volume or 2 ‘coke’ cans per 1/2 a standard cement bag mix - example: a mortar dry mix containing 20kg of cement). • Ideally Efflorein® Mark 2 is added at the end of your normal mixing time, after adding all normal raw material components for the concrete or mortar to the water, (which is preferably put into the mixer first - followed by the cement) but using about 20% (1/5) less water than normal and thoroughly mixing all the components - for an adequate time. Provided that the mixer has enough shearing action to ‘tear’ the mix components apart and to thoroughly mix the rather harsh ‘dryish’, barely damp to the touch consistency of this low water content mix, after the addition of Efflorein® Mark 2 powder and further mixing, the mortar returns to what has become known as normal consistency - without adding any extra water. Therefore, a forced action mixer is best. Less water reduces shrinkage and resultant cracking as well as the possibility of loss of adhesion of hardened wall mortars (‘drumminess’). Less water also increases the hardness, strength and durability of mortars after they have set and hardened. However, Efflorein® Mark 2 still works effectively when added to any kind of mixer before the water - provided you reduce the quantity of water and mix the product into it well. As a suggestion, increase our mixing time by about one third (1/3). • Control the amount of water you use. The lower the water content, the higher the strength, watertightness, weathering and efflorescence resistance of your hardened concrete, mortar or concrete products. Also the faster it will set at a given temperature. A faster setting time could be important to you in winter when the temperature of the mix is low and the setting time of cement is extended as a result. In very low temperatures warm water may be used to mixconcrete or mortar. • Mix thoroughly - at the fastest mixer barrel speed. Another 3 - 5 minutes mixing time can make a beneficially positive difference to the quality of your concrete, mortar and concrete products. • Do NOT use mortar plasticisers (air entraining admixtures) with Efflorein® Mark 2 admixtured mortar or concrete mixes. These will weaken the final cement-bound material or product. Efflorein® Mark 2 results in truly excellent mix plasticity and workability as well as many other benefits - on its own - without other admixtures - except perhaps for Ability’s Cosmotron® DPU-AC powder flow aid, which, with Efflorein® Mark 2 helps to disperse cement grains with even less water for the same consistency to result in even higher strength, higher degrees of watertightness and even less shrinkage. • Protect the work from rain for the first 24 hours after it sets. Please, always remember to: Test first before actual use. Trials are essential!